Most of us haven’t been in the position of shaving our heads to support a friend, but a recent news story about Rachel Hiley, a British legal assistant from Hipperholme, who shaved her head to support her childhood friend stricken with lung cancer, Rachael Litjens, made me think about the depths of true friendship, and how far I’d go for a good friend in need. The Brighouse ECHO reported that Hiley willingly gave up her beautiful long brown hair to support Litjens, an administrative assistant and mother of two teenage boys. Shaving her head also raised money for the Greenlea Oncology Trust. Her shorn locks were donated to an organization that makes wigs for children with cancer. 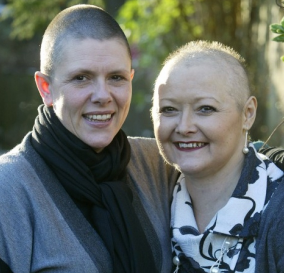 Hiley told the Brighouse ECHO that shaving her head was nothing compared to what cancer patients go through. These women illustrate how deep the bonds of a long and beautiful friendship can go, and remind me that our hair really is a trifle compared to helping friends and family through hard times. I hope you’ll join me in sending healing wishes and prayers to Rachael Litjens.